Fresh herbs make this main bright and just right for spring feasts. One look at this centerpiece roast and your guests will know they’re in for something special. 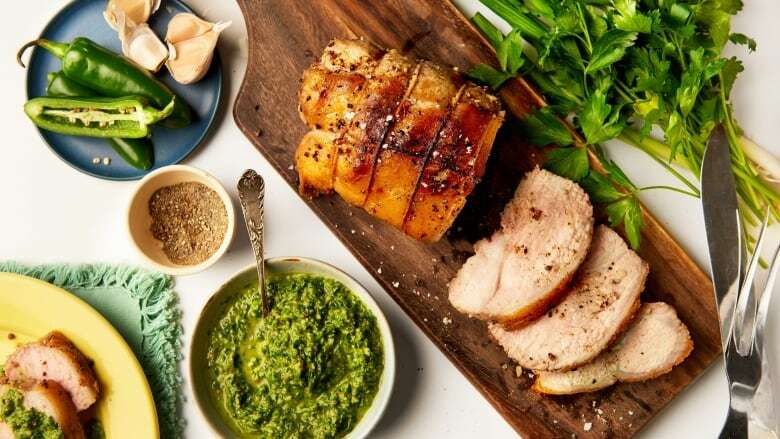 With a vibrant chimichurri to dollop on top (or pass on the side), this is an ideal roast for Easter or any of your spring feasts. Rub the pork loin roast all over with the sea salt, black pepper, minced garlic and olive oil, and cover. Set aside to marinate at room temperature for 45 minutes to 1 hour. Preheat the oven to 450F degrees. Place the marinated pork roast on a roasting rack in the base of a shallow roasting dish and transfer to the oven. Roast for 20 minutes. Remove from the oven and turn the heat down to 300F degrees. Tent with foil and return to the oven to roast for another 90 minutes. Use a meat thermometer to ensure the centre of the roast has reached 145F degrees. If not, return to the oven for an additional 5-10 minutes.Remove roast from the oven and set aside to rest for 10-15 minutes before slicing to ensure the roast does not dry out. While the roast is resting, make the spicy chimichurri. Blend the olive oil, red wine vinegar, jalapeño, garlic, capers, brine, parsley, cilantro, spring onions and mint in a food processor, to a saucy consistency. Slice the pork roast and arrange on a platter. Top with the bright green chimichurri or serve sauce on the side.